The factors affecting climate are changing all over the world. This phenomenon has multidimensional impacts on human livelihoods. Different groups of people are affected in different ways. Among all sectors, agriculture is highly dependent on climate variables. As a consequence, the socioeconomic profiles of farm as well as farmers are changing with the changing climate. In the existing literature there is a large gap about the relationship between climate change and the socioeconomic characteristics of livelihoods. This study is an attempt to find out a conclusive result about the relationship between the agents of climate change and the agents of agricultural sustainability, the effects of climate change on agriculture and socioeconomic status of the farmers, and their patterns of adaptation. This study is mostly focused on paddy sector in the context of Malaysia. It is conducted under the research project “The economics of climate change: Economic dimensions of climate change, impacts and adaptation practices in agriculture sector: Case of paddy sector in Malaysia” of the Institute for Environment and Development (LESTARI) of National University of Malaysia (UKM). This book is divided into seven chapters. Initial chapter provides a background of the study and methodology that consists of data, variables, model and tools for analysis. Chapter two provides a review of related literature about the scenario of climate change; its vulnerability and impacts on agricultural sustainability as well as socioeconomic sustainability of farmers; and the adaptation of climate change in terms of farming practices and socioeconomic practices. Chapter three describes the socioeconomic profile of paddy farming households including the particulars related to social status and economic status of farmers, and firm level activities, assets and production practices. Chapter four assesses the vulnerability of climate change in terms of vulnerability of climate factors, vulnerability of agriculture and paddy farming, and vulnerability of socioeconomic status of the farmers. Chapter five finds out the impacts of climate change on agriculture, especially paddy farming, as well as socioeconomic status of farmers. Chapter six provides the approach and process of adaptation in terms of farmers‟ understanding about climate change, farmers‟ approaches towards adaptation, current supports from external parties for adaptation, and required supports for adaptation. Finally, chapter seven discusses summary and provides policy options and recommendations in term of government policy, farm level strategy, and relevant stakeholders‟ involvement to proper cope with climate change and its adverse impacts. We hope that the book provides the linkage to facilitate better understanding of the socioeconomic perspectives of climate change. We also believe that the book will stimulate further research in the subject and the information provided will assist other researchers in their future research endeavors. Last but not least, the findings and outputs of this book will stimulate the knowledge input for effective policies in addressing the issue of climate change and its adaptation approaches. Alam, M.M., Siwar, C., and Mohd Ekhwan, T. 2010. 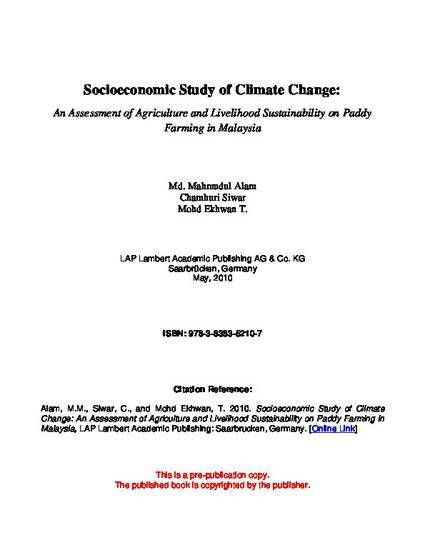 Socioeconomic Study of Climate Change: An Assessment of Agriculture and Livelihood Sustainability on Paddy Farming in Malaysia, LAP Lambert Academic Publishing: Saarbrucken, Germany.